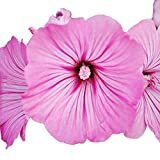 Lavatera trimestris growing herbaceous‎ of the genus Lavatera also known as Annual mallow, Rose mallow or Royal mallow, Lavatera trimestris annual used as ornamental plant, can grow in mediterranean, desert, subtropics or temperate climate and growing in hardiness zone 4-10. Leaves color green in heart shape lobed 3 lobes and wavy. 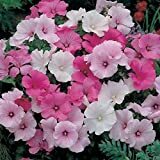 Flower color purple, pink or red in bowl shape with petals merges that in the base. 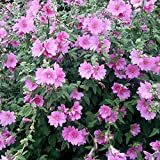 Organic Flower seeds Lavatera trimestris "Mix". 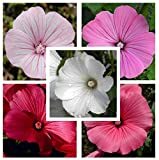 Pink White Mallow. 170 seeds. 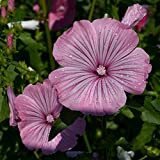 Purple, pink or red flower in bowl shape with petals merges that in the base.